The underlying premise to this post is an interesting one: taking. Is Burning Man like a shopping mall, where you just pick where you want to go and what you want to do; then when you show up, you’re entitled to get that for free? Or is it more like Christmas? A world of one wonderful surprise after another. You never know what you’re going to get next…and whether you like it or not, you have to say thankyou because it’s a gift. As the party grows beyond the limits, it seems that these are the type of things that will come under the most pressure. 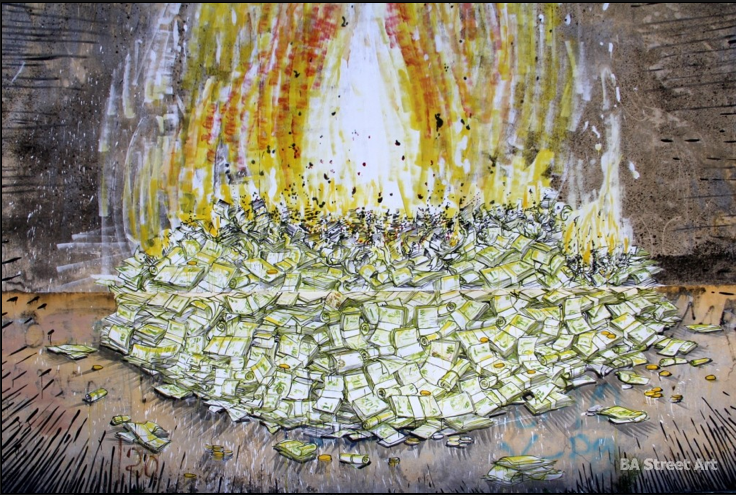 The pile of money floating to the promoters gets bigger and bigger, while at the same time the money required from camps to Gift something to an ever-expanding population increases. Our expenses go up as their revenues go up. The logistics of arranging food for 50,000 people were significant; the logistics of arranging food for 70,.000 people are at least 40% more expensive, and probably more complicated. Every year, the lines get longer. The party is only going one way: bigger. Ticket prices have only ever been going one way: up. Food, energy, labor, and other logistics costs are all increasing due to inflation. These have to be borne by the camps, while Burning Man relies 99% on volunteer labor- even those few who do get paid, choose “labor of love” wages over the lucrative, stock option-laden employment packages that are floating around this scene in San Francisco. This year BMOrg’s costs to put on the party went up to a whopping $11,232,928. Revenues also went up, to $30 million. BMOrg increases its prices much more than inflation, from $35 in 1996 to $200 in 2000 to $448 in 2014. Ticket prices feed back into the production costs, camps have to bring more people out to cater for a larger event, and there are many “hidden” costs like driver access for re-supply. Ticket prices also feed directly into BMOrg’s tax-free treasure chest, since most of their fixed costs are actually for their year-round staff, not the week-long annual event. Even the party-related expenses include $2.5 million in royalty payments to the owners. Forget the Maker movement or the Nobel prize winning idea of micro-finance! This magical organization model could be the economic miracle that fuels the New American Century. Taking is a good way to describe some of the behavior around the food gifting in the French Quarter. I worked in the FQ Bakery as one of those ‘other volunteers’, and many of those who queued for baked goods behaved like takers. Last year we had the capability to produce lots of baked goods. This year will be different. For those who come to the French Quarter thinking that they will be able to queue for free food may be disappointed. We had a terrific group of people who really worked hard in the bakery, but the articles never mention them. Kudos, brave heart, towards you, and towards your mates, of gifting much towards the throwing of this awesome crowd sourced party. The prior awesome Burner culture of most gifting their labours towards the throwing of this awesome crowd sourced party is within the past, the culture has changed towards less givers, most tickets sold towards spectators taking the sights and gifts of the givers, and a very few extreme takers, taking, towards their pockets, by simple maths, $38 million to $50 million, of cash, from the party. I must update the numbers, of within the prior post of $28 million to $45 million, for including the usage levies, by appearance, paid towards the Decommodification LLC pockets of Larry and crew, to licence their Burning Man(TM) trademarks, of, by simple maths, $2.5 million each of 2013, 2014, 2015, and 2016, in addendum of their salaries paid from the Burning Man Project, within 2014, 2015, and 2016. As stated priorly, click upon this links of this post, it is sourced upon their numbers, their statements, and their corporate records, and prove anything to be incorrect, of which, none others, as of yet, have done. As burnersxxx stated, has The Burning Man Project truly mastered the sharing economy, and is offering us a revolutionary new business model? They have paid brilliant lawyers, but, I still fail to discern the manner upon which they might maintain 501(c)3 status, with Marian as Chief Executive Officer, Larry as a Executive Director, the ones, as Larry stated, making the big decisions, while taking, by appearances, and, by simple maths, many millions of cash, mostly free of taxation levies, towards their own pockets, and, while having lead pockets towards mostly volunteer labourers donating their labours, for near free, towards the BRC LLC, owned by the Burning Man Project, yet hiding the payments towards their pockets from the awesome artists, volunteers, sound camps, and others whom throw this awesome crowd sourced party. Why is it so necessary to commodify Burning Man on swag to bring in donations. I think it only makes something special common place… anyone can have it for a few bucks. I don’t see that as being a prize worth having but I’m sure many would. My theory is that Burning Man will implode on it’s sell and I think commodifying it is the beginning of the end. I have to say, I’m disappointed you’ve decided to look at it this way. Taking could easily be replaced with experiencing. Santopalato FWIW, was gifting places at the table to artists…it was a way of giving back. Sure they had a funder’s dinner too, but the premise was gifting. Couldn’t we always look at the gifting economy (if we wanted to be curmudgeons) as a taking one???? Furthermore, to many, food is their art. So I am *taking* from artists when they gift their art to the playa. I am *gifting* to those taking. We could spin it all negatively if we chose to. And it’s your blog and you can do whatever you damn well please (acknowledged). I’m not bashing the food camps for giving, they’re awesome. 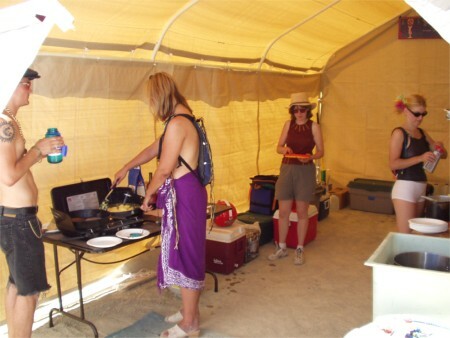 I’m querying the mentality of those who plan their meals at Burning Man, expecting that each will be provided by others. In my opinion, camps should be allowed to have fundraising dinners, and to use the BM logo on their medallions etc. So I visited the ‘fundraising’ page on the bman site and found it very interesting that they specifically state that the man logo CANNOT be used on any schwag gifts that are offered in exchange for donations. “Even fundraiser gifts”?!? So two pages on their website with completely opposite rules. So what is it?? Truly think it is BS if they will come after people to use the logo on items that they are giving away as a thank you for people donating money to art projects/theme camps that make the event what it is. Welcome to BMorg! It’s the “dynamic between the principles, the tensions and interplay” … which somehow makes it all special. Just use )'( , they can’t trademark that.